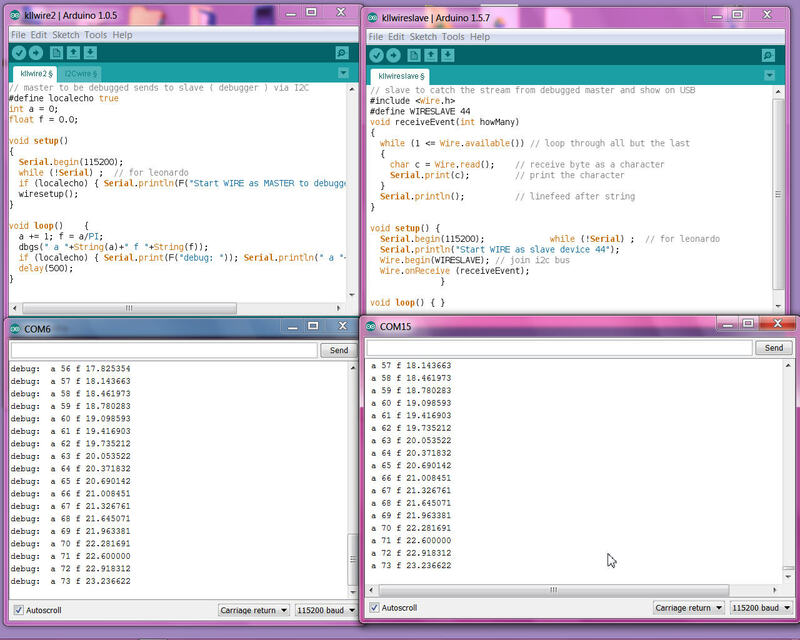 many questions about arduino debug, but well, there is only the idea to use many prints. now: that can be improved by this idea from 4um using it as a macro with a compiler switch to disable it. and add i try to combine it with my style using a menu variable to toggle this diagnostic prints by menu. but if you want put in some money, this might be close to real debugging. if i ever test / buy it, i will report about it here. the tools from NICK look cool, but are pre IDE1.0.0 and not run anymore. still i want play I2C and start from the basics, also find this. 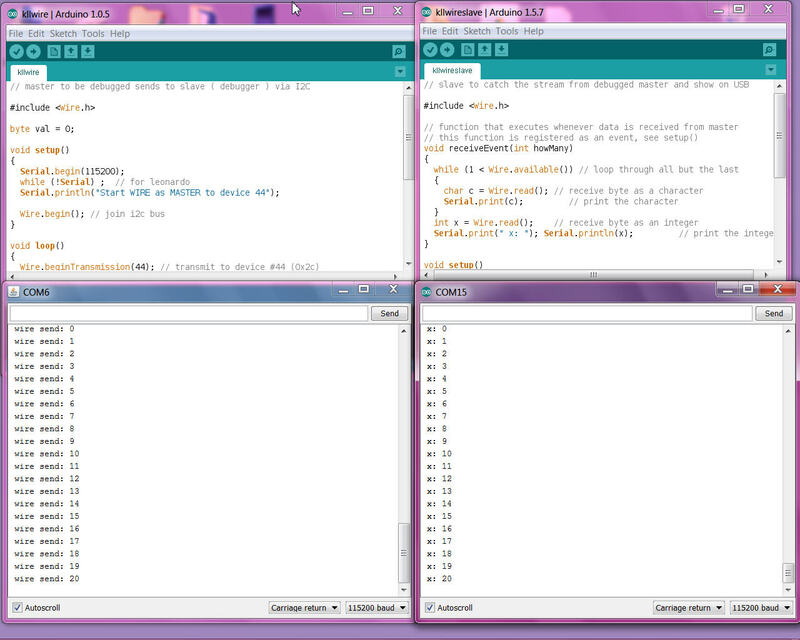 so i started with 2 different IDEs so i can adjust 2 com ports and have 2 terminal windows open. the Save will be connected to a PC ( by USB ) so 5V is there. and we need the Slave because the Master is connected to PC and doing data exchange ( USB ) what we don't want to disturb by the diagnostic outprints. so also the Master is connected to ?same? PC and there might not even a GND wire be required. actually with AND without the ground wire this 5V ( TTL ) signal level is weak and needs to be checked, for connection 5V and 3V3 arduinos need bidirectional level shifters. For longer bus cables ( like 20m ) need I2C-bus extender, they try to change the serial TTL Volt signal to a 10 times higher current. That remembers RS232 to RS422. DUE D20 (SDA), D21 (SCL), 1k5 pullup to 3V3! but when that is a INTeger there will be a rollover every 3 sec ( if no wait, no other serial I/O is used ). but nothing else. so at first i changed the menu program that it sends also at boot a msg. "boot" via I2C. when i close that arduino terminal window i see in the debug terminal window that the UNO boots again!!! now that is news and i never see / think about that, how could i. Start WIRE as slave device 44 ( thats the boot msg from I2Cslave MICRO PRO and then the debug lines from UNO also come. but not the boot and first loopreport time info from UNO.